Investing, particularly long-term investing, has changed quite a bit since the early days of portfolio theory. It used to be investors split their holdings between stocks and bonds, with the stocks diversified by industry or sector. Bonds tended to be confined to medium or long-term Treasuries. These days, ETFs have changed the way investors are able to construct a portfolio. We have access to asset classes and investment vehicles that were formerly reserved for only the wealthy. At the same time, current financial theory has shown investing in multiple asset classes is the safest way to go for long-term investing. Instead of picking up a few stocks and some basic bonds, it now makes sense to divide your portfolio up into 10 to 15 different asset classes. This includes everything from emerging market stocks and real estate to commodities and international corporate bonds. And as I mentioned above, for essentially whatever you’re looking for… well, there’s an ETF for that. Most active investors are familiar with the variety of popular ETFs for trading stock-based asset classes. These include domestic large cap, domestic small cap, international developed nation stocks, and emerging market stocks, which are all quite heavily traded. On the other hand, there are fewer investors who are aware of the many bond-based ETFs out there. Sure, domestic government bond and high yield bond ETFs are actively traded, but does the average investor know about international government and corporate bonds? What about emerging market bonds? Moreover, how active are the options in some of these more obscure bond ETFs? It turns out when it comes to emerging market bonds, the most popular ETF in the space may not be as obscure as you’d think. 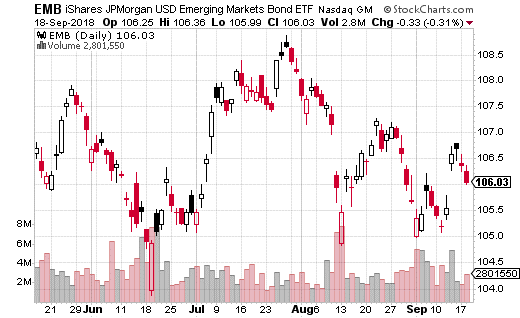 In fact, iShares JP Morgan USD Emerging Markets Bond ETF (NASDAQ: EMB) has nearly $14 billion in assets under management. The fund also averages a reasonable 10,000 options contracts per day traded. It’s hard to say if EMB is used more by money managers or retail investors themselves. However, the benefits are obvious. As a unique asset class, the ETF has a very low beta of 0.21 (very low correlation with large cap stocks). And, it’s current yield is over 5%. Admittedly, I don’t normally pay much attention to EMB. However, some unusual options action in the name this week called it to my attention. So what are the options traders saying? A well-capitalized trader sold around 20,000 of the October 19th EMB 107 calls for $0.40 and $0.45 with the stock at about $106.35. That’s a breakeven price of $107.45, or only about $1 higher than the current price. The trader keeps all the premium (a total of about $1.1 million) if the ETF remains below $107 by October expiration. On the other hand, the call seller has unlimited risk above $107.45 should EMB shoot higher. Now, EMB isn’t the type of stock that will gap up, but that’s still a lot of risk to take – short 20,000 calls only $1 higher than the current ETF price. There are couple possible reasons for the trader taking such a sizeable short position on EMB. The first one is the call seller is already long a large amount of EMB shares and is simply doing a call overwrite to earn some extra yield. Another possibility is the trader believes EMB is capped due to the fund’s exposure to riskier sovereign debt. In fact, the fund’s second biggest holding is debt from Turkey, which we know is a current hotspot for debt concerns. Basically, the trader may not believe EMB is going to plunge (once again, it’s not that kind of ETF), but could very well believe the price isn’t going any higher due to certain bond holdings in its portfolio. This would be a very reasonable thesis behind selling calls. Nevertheless, I never recommend selling naked calls. It’s simply too much risk to take on. Selling a call spread won’t work either in this case because the options are too cheap (EMB isn’t volatile enough). However, the idea of doing a covered call on EMB could be a very easy way to generate yield. Since the big call sale this week, the stock has fallen to about $106. I’d be comfortable selling the November 107 calls for $0.50 or more against the stock. That trade protects you down to $105.50, will generate a small yield on the calls, gives you some room for stock appreciation, and collects a dividend on October 1st. Plus, given the dividend, the stock isn’t likely to climb above $108, meaning your shares probably won’t get called away on November expiration. My trades this year have been on fire. I’m finding the most boring, beaten down sectors and pulling down massive returns from them using my Disruptive Dividends options trading strategy. Join me on Wednesday, September 26th for a live interactive training on how you can bring home these same gains. Plus, I’ll give you my four newest trades to place the next morning and then take your questions at the end. This is not another sales video. This is a live training session to show you the power of the Disruptive Dividends options strategy. Registration is free: CLICK HERE.